We are very proud to announce that our award winning aeronautical data validator platform now fully supports the schematron business rules for validation of IWXXM formatted Operational aeronautical meteorological (OPMET) messages. At present, the IWXXM business rules we use for validation enforces compliance with lot of aspects of Annex 3 of Meteorological Service for International Air Navigation. Concept proofing tests to validate IWXXM formatted OPMET messages had been successfully conducted and it is immediately available for all registered users. The real time validation of large IWXXM documents is possible thanks to the unique, optimized service architecture with fastest XML validator and schematron rule evaluation engine currently available in the aviation industry. 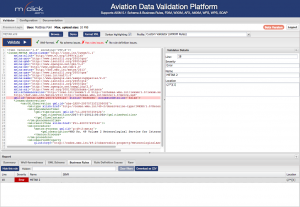 Aeronautical Data Validation Platform has numerous unique capabilities. Built on the results of research activities, it is aware of all modern aviation data formats and supports predefined and custom business rules. The users can perform quality assessments for any kind of aeronautical documents verifying their conformance to industry standards. Users can also create custom validations for the most diverse business cases, which now becomes true for the weather data, as well. Don’t forget, the data validation ability is one of the most essential SWIM infrastructure features! Take advantages of SWIM technical infrastructure, test the data validation platform for free and check how it helps to ensure the highest possible data quality.